Russia i/ˈrʌʃə/ or /ˈrʊʃə/ (Russian: Россия, tr. Rossija; IPA: [rɐˈsʲijə]), officially known as both Russia and the Russian Federation (Russian: Российская Федерация, tr. Rossijskaja Federacija; IPA: [rɐˈsʲijskəjə fʲɪdʲɪˈratsɨjə]), is a country in northernEurasia. It is a federal semi-presidential republic, comprising 83 federal subjects. From northwest to southeast, Russia shares borderswith Norway, Finland, Estonia, Latvia, Lithuania and Poland (both via Kaliningrad Oblast), Belarus, Ukraine, Georgia, Azerbaijan,Kazakhstan, China, Mongolia, and North Korea. It also has maritime borders with Japan by the Sea of Okhotsk, and the United States by the Bering Strait. At 17,075,400 square kilometres (6,592,800 sq mi), Russia is the largest country in the world, covering more than one eighth of the Earth‘s inhabited land area. Russia is also the eighth most populous nation with 143 million people. It extends across the whole of northern Asia and 40% of Europe, spanning nine time zones and incorporating a wide range of environments and landforms. Russia has the world’s largest reserves of mineral and energy resources and is the largest oil producer and second largest natural gas producer globally. Russia has the world’s largest forest reserves and its lakes contain approximately one-quarter of the world’s fresh water. The nation’s history began with that of the East Slavs, who emerged as a recognizable group in Europe between the 3rd and 8th centuries AD. Founded and ruled by a Varangian warrior elite and their descendants, the medieval state of Rus arose in the 9th century. In 988 it adopted Orthodox Christianity from the Byzantine Empire, beginning the synthesis of Byzantine and Slavic cultures that defined Russian culture for the next millennium. 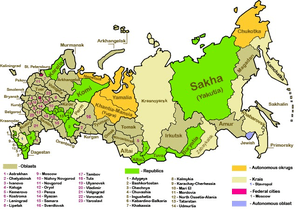 Rus’ ultimately disintegrated into a number of smaller states; most of the Rus’ lands were overrun by theMongol invasion and became tributaries of the nomadic Golden Horde. The Grand Duchy of Moscow gradually reunified the surrounding Russian principalities, achieved independence from the Golden Horde, and came to dominate the cultural and political legacy of Kievan Rus’. By the 18th century, the nation had greatly expanded through conquest, annexation, and exploration to become the Russian Empire, which was the third largest empire in history, stretching from Poland in Europe to Alaska in North America. Following the Russian Revolution, Russia became the largest and leading constituent of the Soviet Union, the world’s first constitutionallysocialist state and a recognized superpower, which played a decisive role in the Allied victory in World War II. The Soviet era saw some of the most significant technological achievements of the 20th century, including the world’s first human spaceflight. The Russian Federation was founded following the dissolution of the Soviet Union in 1991, but is recognized as the continuing legal personality of the Soviet state. Russia has the world’s 11th largest economy by nominal GDP or the 6th largest by purchasing power parity, with the 5th largest nominal military budget. It is one of the five recognized nuclear weapons states and possesses the largest stockpile of weapons of mass destruction. Russia is a great power and a permanent member of the United Nations Security Council, a member of the G8, G20, theCouncil of Europe, the Asia-Pacific Economic Cooperation, the Shanghai Cooperation Organisation, the Eurasian Economic Community, the Organisation for Security and Cooperation in Europe (OSCE), the World Trade Organisation (WTO), and is the leading member of theCommonwealth of Independent States. Russia has signed a free-trade deal with seven other former Soviet republics that will scrap export and import tariffs on a number of goods. The agreement was announced following talks in St Petersburg. The other signature countries are Ukraine, Belarus, Kazakhstan, Armenia, Kyrgyzstan, Moldova and Tajikistan. No details have yet been revealed about what goods will be included. Uzbekistan, Azerbaijan and Turkmenistan may join by the end of the year. The free trade agreement now needs to be ratified by the parliaments of the eight countries who have so far signed up, before becoming effective in 2012. Russian Prime Minister Vladimir Putin said the move would make their collective economies “more competitive”. Analysts said Ukraine’s inclusion was significant, as the country had previously sought closer trade ties with the European Union. However, Ukraine’s current government of President Viktor Yanukovych is seen as being more pro-Russian than its predecessor. Last week, Ukraine’s former prime minister Yulia Tymoshenko was jailed for seven years for acting beyond her powers over a 2009 gas deal. The European Union said the trial was politically motivated, but this was denied by Kiev.